The DNA Tower derives its name from the deoxyribonucleic acid (DNA) double-helix molecule, which is found in all cells and controls the development of life. 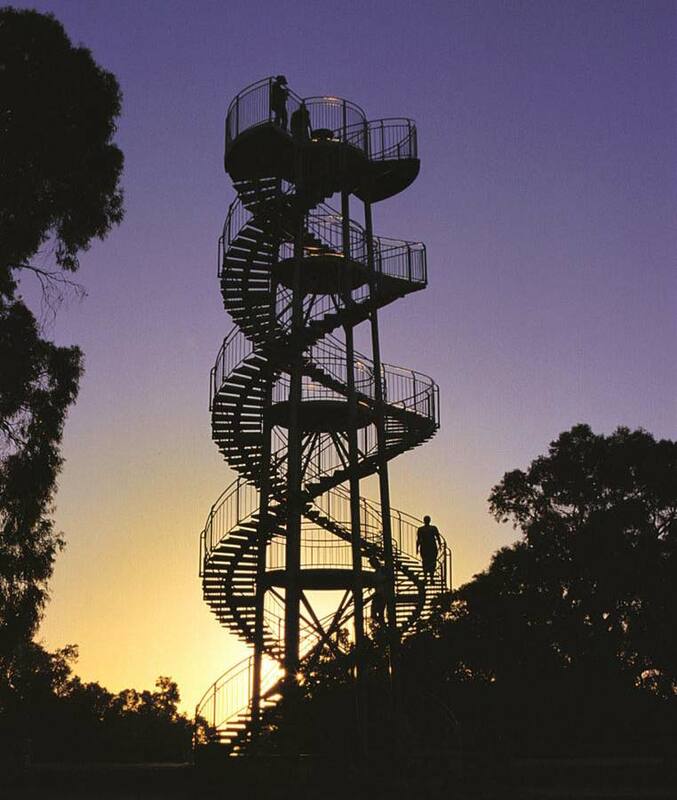 It is the highest viewing point in Kings Park with spectacular views throughout the climb. On a clear day you may even be able to see the Indian Ocean. The park commissioned the construction in 1966 by D&H Fraser Consulting Engineers. The 15m high staircase has 101 steps and was inspired by the famous double staircase in a Chateau in Blois, France. The paving and wall surrounding the DNA Tower was constructed using stones from 11 towns and 80 shires within Western Australia. The original design included a shallow reflecting pond at the base of the tower. It was replaced with Karratha stone paving in 2001 to enhance visitor safety.